Be the set of samples absorbance or transmittance at the wavelength. 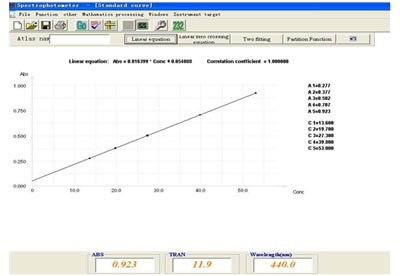 Quantitative analysis of samples can be obtained by a standard sample concentration factor, read the sample concentration. Quantitative analysis of samples, standard samples can be used multiple (two or more) to establish the wavelength of absorbance - concentration curve, and thus the unknown sample concentration curve obtained. Can record the absorbance, transmittance, or the curve of energy with wavelength, and peak value measurement, data processing, map composition, map display. Samples can be recorded at the set wavelength absorbance or transmittance versus time curve. In addition, in order to better help users test sample.The company has developed a series of accessories and application software.